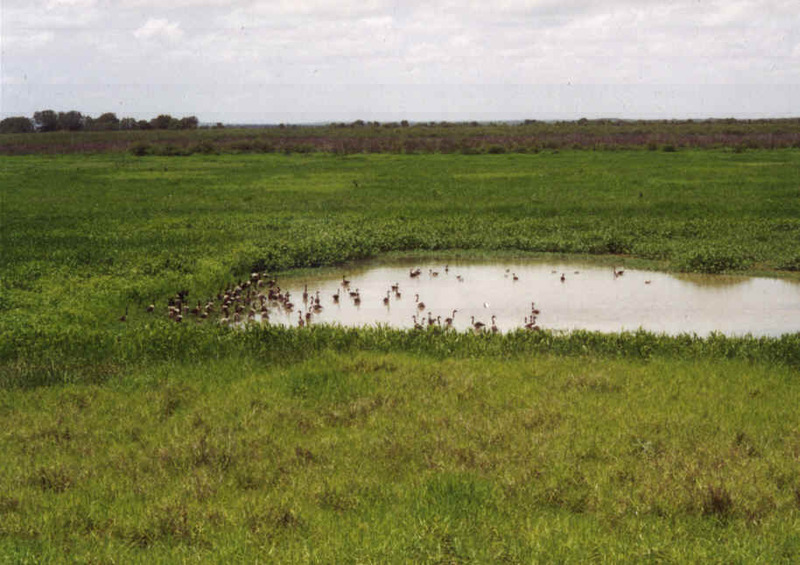 Wetland habitats of the Top End (M. Michie after NTDE, 1994). Click your cursor over the picture to go to the description or use the table below. It is generally accepted that Aborigines first arrived in Australia 60 000 years ago. It is possible that it could have been earlier than that, but at least there is positive archaeological evidence that people have lived in the Top End for 25 000 years. At that time the region was much drier, more sparsely vegetated and relatively cool. The world was in the grip of a great ice age and much of the Earth's water was frozen at the poles. The sea was some 350 km further north and Australia was joined to New Guinea. At the end of the ice age world temperatures began to warm up, the ice gradually melted and sea levels began to rise. Increased rainfall from about 10 000 years ago created a vegetation of forests and woodlands much as they are today and also caused the spread of pockets of rainforest. As sea levels rose the present river valleys were flooded. The floodplains gradually silted up leading to the development of mangrove swamps about 7000 years ago. Within the last 1500 years siltation and the levee formation (high riverbanks) restricted the intrusion of salt-water tides and allowed the formation of the present freshwater swamps and floodplains that are filled up each year. The floodplain landscape is a comparatively young one, and it is still evolving. Mangroves are usually associated with estuaries and other coastal landforms but in the Top End they also line the riverbanks of the tidal rivers for a distance of up to 50 km from the mouth. The largest mangrove communities of the region are on Darwin harbour and the estuaries of the Adelaide and West Alligator Rivers. The mangrove lined estuaries are interesting habitats because they form a transition zone between the coastal marine areas and the freshwater rivers that empty into them. Because of the large tidal ranges of the region, fishes in the mangrove habitat could be expected to be tolerant of both salt and fresh water. Some fish species such as the barramundi and the ox-eye herring spawn around the river mouth and their young develop in coastal swamps. 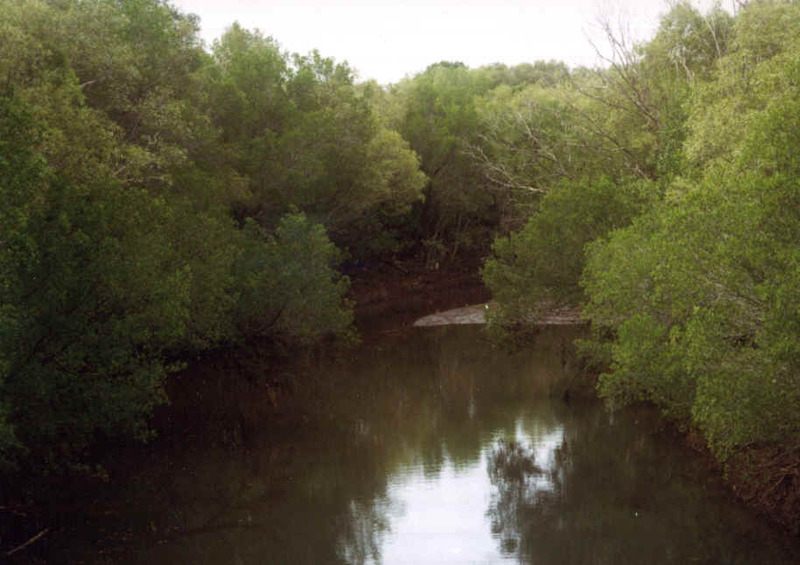 When ready, juveniles move into the mangrove estuaries and migrate upstream. At 3-4 years of age they migrate back to salt water to breed. At this stage adult male barramundi change into females. Other fish species of the mangroves are mangrove jacks, a medium sized predator of other fishes, the estuary or brown stingray and the common hardyhead, a small fish that forms dense schools. There are about 10 species of mudskippers in the NT and the most commonly seen are the mudskippers from the genus Periophthalmus that grow to 50-100 mm in length. Fiddler crabs grow to a width of up to 35 mm and the males are equipped with one large colourful claw for mating displays. They live in the intertidal zone, eating algae from roots, stones, decaying leaves or the detritus of the estuary. They are tolerant of a large range of salinities. Mangrove, land or marsh crabs, are a larger species up to 40 mm in width. They are responsible for most of the burrows seen along the high tide mark in mangrove forests and are scavengers and predators. The large mud crab, Scylla serrata, (up to 200 mm wide) is fished commercially and lives on the muddy banks or bottoms of mangrove estuaries. Young banana prawns drift into mangrove estuaries from the coastal spawning grounds while they are in a larval stage. They develop into juveniles and remain for a time in the safety of the mangroves. Two or three months after arriving, usually in the wet season, they then migrate into deeper waters offshore. Without the mangrove and seagrass nurseries there would be no prawns and no prawning industry; a fact that is often overlooked by planners and developers. Mangrove habitats support a number of bird species: the mangrove golden whistler, the mangrove robin, the collared kingfisher and the red-headed honeyeater. Striated herons and reef egrets breed in the mangrove forests and the brahminy kite circles over estuaries searching for prey. Large reptiles found in the mangroves are the highly patterned mangrove monitor, the crab-eating white-bellied mangrove snake, the bockadam (another snake found in the mangroves) and the estuarine or saltwater crocodile. The little-known and rare false water-rat (Xeromys myoides) nests in clay mounds near the base of mangrove trees and eats crabs. Black flying foxes favour mangroves and islands in the estuaries of large rivers as safe camps and thousands can be seen at nightfall flying towards their feeding grounds. The rivers are the lifeblood of the wetlands system. They determine the physical structure and terrain of the region and shape the land so that numerous habitats are formed which in turn support the rich variety of wetlands wildlife. Sand and silt are the building materials of the rivers. The heavy monsoonal rains of the wet season are responsible for transporting and dumping these materials resulting in the gradual building up of the floodplains and river levee banks. The rivers of the region, the Adelaide, Mary, Wildman, West Alligator, South Alligator and East Alligator Rivers are at various stages of development. 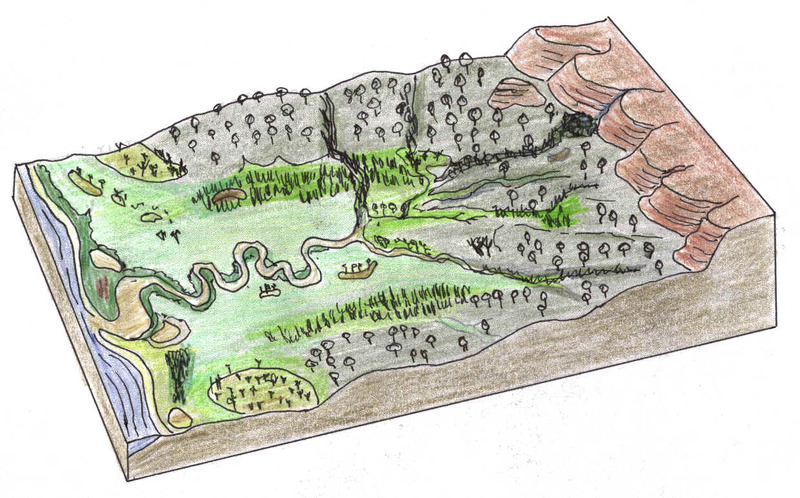 The Adelaide River follows a clearly defined course after it emerges from the woodlands onto the flood plain and then it follows a sinuous path to the sea. The South Alligator River's upper reaches do not connect directly with the tidal part of the river, but spread out at Yellow Waters into a broad basin which is drained by multiple unconnected channels to form the main river once again. The Mary River is a clearly defined stream where it is crossed by the Arnhem Highway, but soon spills out onto a black soil plain where it divides into a series of channels and connected lagoons or billabongs, some of which are the remains of an older river bed. The river itself does not reach the sea but in the wet season empties out onto coastal swamps that drain into the sea via a number of small creeks. The physical structure of the rivers, along with the seasonal cycles of the region create a set of environmental conditions which affect the lives of all the wetlands organisms. Because each year is different in terms of the amount of rainfall, the time of its arrival, the length of the wet season and the intensity of storms, wildlife of the Top End wetlands needs to be above all, adaptable. Large silver-leafed paperbarks (Melaleuca argentea) are the most common tree in many stretches of the main rivers and their sheer size and grandeur dominate the riverbank scene. Besides the trees previously noted from riparian habitats, other trees lining the banks may include the pine-like Leichhardt tree and the red-flowering bombax tree. Birds often associated with the riverbank vegetation are the red-tailed black cockatoo, the varied lorikeet, the spangled drongo and the white-throated honeyeater. Pelicans congregate on the quiet reaches of major streams. Little black cormorants, white-bellied sea eagles, darters and little pied cormorants are also common along the rivers. The sugar gliders and the brushtail possums that are also common in the woodlands use the trees of the riverbanks for shelter. The freshwater crocodile lays its eggs in river sandbars, where they are eagerly sought after by Gould's sand goannas. The pig-nosed turtle has been observed in the Daly River and the South and East Alligator Rivers. It eats fruit from pandanus, bush apples (Syzygium spp.) and figtrees (Ficus racemosa) that drop into the water. Macleay's water snake hides amongst exposed tree roots by river banks to ambush its prey  fishes, eels and frogs. Salmon catfish seek food on the beds of the rivers, eating anything that comes their way, while longtoms cruise the surface under overhanging vegetation looking for small fishes or freshwater prawns. Barramundi, sleepy cod and Butler's grunter are other river dwellers. After flowing down the creeks of the rolling woodlands, the rivers emerge onto expansive floodplains. The channels across the floodplains are not necessarily continuous, and the floodplains act like a huge retarding basin, storing the water up over the wet season and gradually releasing it. The waters drain back into the main channel that completes the journey to the sea with levee banks on either side. The floodplains are built on three levels. The high land closest to the river forms the grassy plains that may only flood to a depth of 3 cm, or in some seasons not at all. This is where the paspalum, couch and millet grow. Solitary clumps of pandanus are the only trees on the grass plains. Beyond the grass plains are the sedgelands, the typical wet season swamps covered with sedges, rushes, wild rice, waterlilies and other aquatic plants. The sedgelands appear complex because of the many channels criss-crossing the habitat to connect deeper lagoons and ponds. The water in the sedgeland floods to a depth of about 75 cm. The lower plains are the first to flood in the wet and the last to dry out when the dry season arrives. These are the paperbark swamps and they may be flooded to a depth of 1 m. They adjoin the woodlands that border the floodplains, and obtain water from small creeks and local surface runoff. They are a place of refuge and haven for many of the wetlands animals. Not all of these parts of the floodplains are necessarily found in the one place. Often one type of floodplain vegetation blends in gradually with the other, the type of vegetation depending on the seasonal conditions. Animals of the wet season. Fishes that appear in the shallow waters include spangled grunters, chequered rainbowfish and reticulated glassfish. Large numbers of damselfly and dragonfly nymphs appear along with other aquatic insects providing food for Rajah shelducks. Other ducks appear in great numbers: plumed whistling-ducks, wandering whistling-ducks and Pacific black ducks. All four species of egret, plus the glossy ibis, brolga, black-necked stork (jabiru) and the magpie goose gather for the abundant food provided by the wet season and many birds breed at this time of the year. The magpie goose in particular has its whole life style and breeding cycle tied into the seasonal changes of the floodplains. About 25 species of waders of the sandpiper and plover families use the floodplains as a migratory stopover. Arafura file snakes, confined to permanent billabongs for the dry (one scientist captured, marked and released more than 2000 filesnakes from Dja Dja billabong) spread out across the floodplains in the wet season along with olive pythons and water pythons. Animals of the dry season. Water pythons and dusky rats are the main inhabitants of the floodplains in the dry season, but other animals, such as dingoes and barn owls, may also be active in what appears to be a lifeless habitat. Ground-dwelling birds such as the brown quail, masked lapwing, Richard's pipit and Australian pratincole find sufficient food (fallen grass seeds, new growth after fires, and insects) to exist through the dry season. Black kites swarm around the fires that sweep through the grasslands in the dry season, catching insects and lizards disturbed by the approaching flames. The olive whipsnake hunts for skinks in the clumps of grass, and the black-headed python searches for small mammals and birds in crevices and cracks in the soil. The yellow-spotted monitor usually chooses higher ground on the floodplain to dig its burrow. Four species of Melaleuca form the paperbark forests. 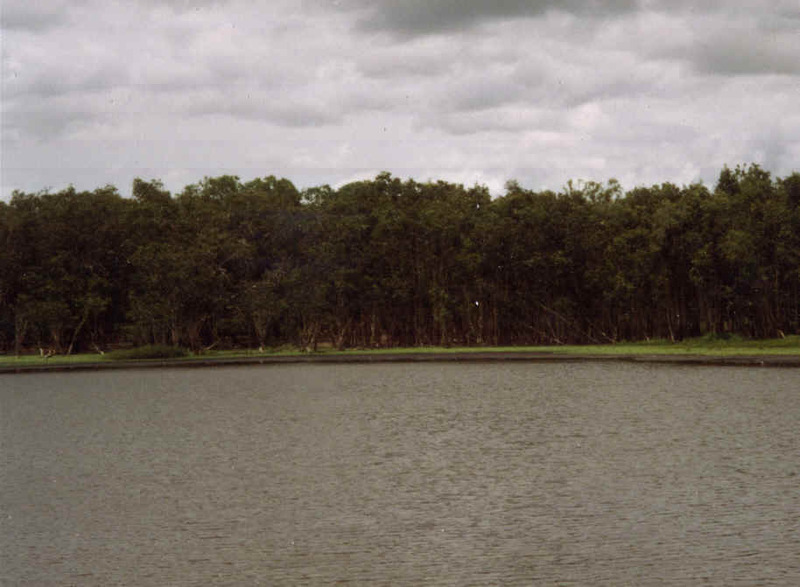 Two, the cajaput tree and the white paperbark, occur in areas that are flooded for up to eight months whilst the other two species are found in swamps flooded for only a short time. All paperbarks are prolific flower producers and attract large numbers of insects and nectar feeding birds when in flower. Fish species that are common in many wetlands habitats in the wet season may be found in the paperbark swamps e.g. the black-banded rainbowfish and the banded grunter. Reptiles of the paperbark swamps include the swamplands lashtail and Mitchell's water monitor that is often seen on partly submerged trees. The swamplands lashtail's main diet is insects, especially green ants. It is inactive in the dry season, hiding under fallen timber or the paperbark roots where other animals such as water rats may also shelter. Dahl's aquatic frog floats in the water with its legs outstretched to prey on insects and other frogs. Males of the large green tree frog call from the ground during the breeding season and high in trees at other times. The brown tree frog requires deep pools for breeding. The little red flying fox congregates in numbers to use the paperbarks as a resting place during the day. The little broad-nosed bat roosts in tree hollows in the paperbarks. The large-footed mouse-eared bat that forms colonies of 10-15 in dense foliage hunts by raking the surface of the water with its claws as it flies low over swamps and rivers. Radjah shelducks, Pacific black ducks, little grebes and pairs of green pygmy geese will be often seen feeding in the paperbark swamps and the lemon-breasted flycatcher is common in this habitat. Forest kingfishers favour this habitat and often use termite nests in trees as a nesting place of their own. The distinctive call of the whistling kite can often be heard as it patrols the treeline at the edge of the paperbark swamps. before reaching the rivers, tributary creeks in the upper catchment area may become eroded, widened and deepened, so that sometimes in the dry season a watercourse may be a string of waterholes or billabongs joined by a sandy creek bed. The water in billabongs flows at a slower rate than in the main rivers and creeks. This is an advantage for most of the aquatic creatures, allowing them to feed and breed without having to cope with fast currents. However, when water stops flowing in the dry season and levels in the billabongs drop, organisms are gradually placed under stress because of higher temperatures and reduced oxygen levels in the water. Fishes such as the omnivorous banded grunter have evolved in Northern Territory drainage systems and are tolerant of a wide range of conditions. The sooty grunter prefers billabongs with sandy bottoms in the upper reaches of the rivers and creeks. It is an important dispersal agent for pandanus seeds. The sailfin glassfish, empire gudgeon, mouth almighty and Rendahl's catfish are other residents of the billabongs. Redclaw yabbies live in waterholes with abundant vegetation and are detrivores, obtaining organic matter from silt and mud. The water rat digs a tunnel for shelter besides a waterhole and feeds on freshwater snails, mussels, yabbies, fishes and large insects. Rainbow bee-eaters also make their nests in tunnels in the banks of billabongs and purple swamphens hide in the sedges at the water's edge. The widely distributed white heron and the smaller pied heron hunt in shallow water around lagoons and swamps. The azure kingfisher and little kingfisher are two small kingfishers of the billabongs: other birds include the blue-faced honeyeater and dollarbird. Macleay's water snake, file snakes, keelback snakes, crocodiles and olive pythons occur in this habitat, each having its own preferences and strategies for hunting prey. Gilbert's lashtail lizard perches on branches or termite mounds near waterholes, feeding on insects or smaller lizards. The northern snake-necked turtle and the northern snapping turtle also inhabit rivers as well as permanent lagoons and billabongs. What is not obvious in the billabongs is the huge population of microscopic plants and animals (plankton) that supports the larger species of the permanent waterholes. Microcrustaceans, rotifers and amoebae are some of the zooplankton that provide an energy source for small aquatic insects that in turn are the basis of other food chains. It would be difficult to exaggerate the incredible diversity and ecological value of the microscopic freshwater life of the wetlands. Woodlands have a 10-30% foliage cover, compared to 30-70% for open forests. In the Top End the two merge into each other with different species of eucalypts being dominant in the different communities. For the purpose of our habitat overview, the term woodlands will be used. Broadly speaking. it is the type of vegetation that surrounds Darwin and lines most of the Arnhem Highway. The woodlands provide the setting for the Top End wetlands. The upper reaches of the rivers flow through woodlands after leaving the hills and escarpments, and woodlands form a corridor in which the longer rivers and their floodplains lie. Animals of the woodlands may use the adjoining floodplains as a resource for food, whilst the woodlands provide a place of refuge for some animals of the floodplains when the wet season arrives. Although not having the scenic appeal of the floodplains nor giving the appearance of a species rich habitat, the tropical woodlands in fact support a variety of plant species and associated wildlife. In this habitat there are 64 species of mammals, over one quarter of Australia's total number. Most of the carnivorous mammals are nocturnal, including the brush-tailed phascogale, the red-cheeked dunnart, and the northern quoll. The most common of nocturnal carnivores is the fawn antechinus. The northern brown bandicoot is also nocturnal, but omnivorous, eating seeds, berries, plant roots, spiders and earthworms. The antilopine wallaroo, agile wallaby and common wallaroo are herbivores. Bats are the largest group of mammals, some flying foxes being important pollinators of eucalypts and paperbarks. Most bat species are insect eaters although there is a fish eating bat, the mouse-eared bat. There are 14 species of rodents, ranging from the large black-footed tree rat to the small delicate mouse. Dingoes and echidnas are common in the woodlands. The northern brown tree snake, death adder and king brown are some well known snakes of this habitat. The lesser black whipsnake is perhaps not so well known and feeds on skinks, dragons and frogs. Frilled lizards are the most popular and widely recognised reptile of the woodlands, whilst the smaller but equally common northern two-line dragon remains relatively inconspicuous. Birds in the woodlands are represented by the blue-winged kookaburra, the pied butcherbird, the black-faced cuckoo-shrike, friar birds and the brown honeyeater. The barking owl and southern boobook owl are the most common of the nocturnal hunters. Besides the two species of lorikeets, three other parrots live in the woodlands: the red-winged parrot, the northern rosella and the hooded parrot. At first acquaintance the tropical woodland seems typical of Australian bushlands in any state with its familiar mixture of eucalypts, wattles and a scattering of woody shrubs as an understorey. Several features give the Top End woodlands a distinctive tropical look and feel. Termite mounds, built by various species, occur throughout the woodlands and there are a number of palms, Cycas and Livistona species that add an exotic tropical touch to the landscape. A number of smaller trees form an understorey in the eucalyptus dominated community. They include species of Terminalia, Syzigium and Brachychiton. The first two genera provide bush fruit for Aboriginal gatherers, as do two other smaller trees: the cocky apple (Planchonia careya) and the green plum tree (Buchanania obovata). There are small rocky hills and outcrops scattered over the woodlands terrain and these are the ultimate places of refuge when cyclone generated rains flood parts of the woodlands. Echidnas and black wallaroos are adapted to this particular habitat and various bat species use the caves for roosting places. The Children's python takes advantage of this abundant supply of food and is often seen near the roosting sites. The endemic chestnut-quilled rock pigeon always shelters amongst rocks that are close to water. Copland's rock frog is common along rocky creeks and also lives in caves. Similar in appearance, the masked rock frog is rarely seen. 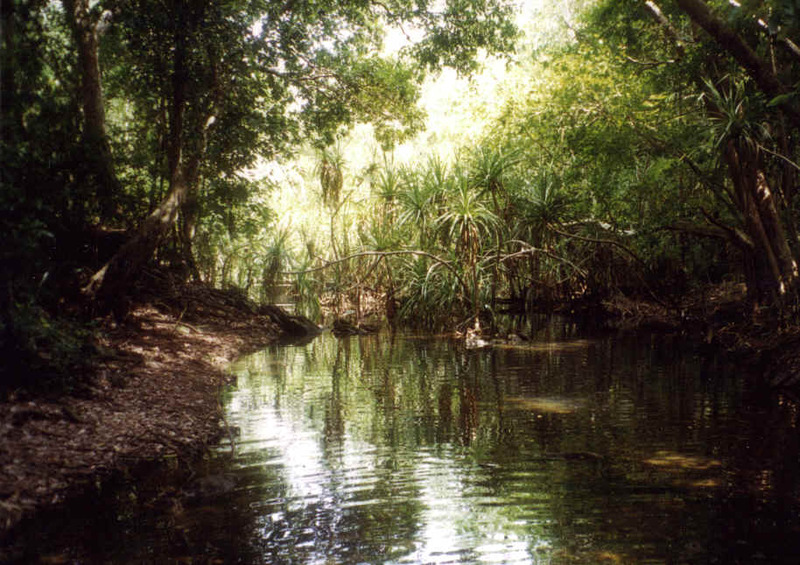 Coastal monsoon forests of the Top End wetlands may occur in small patches where there is permanent water associated with springs and seepages. Trees in these evergreen forests include rotten cheesefruit or great morinda (a popular food plant of Aborigines), native nutmeg and Macaranga species. Most coastal monsoon forests of the region, however, are on well drained soils that dry out in the dry season. Some of the forests are quite small but one patch on the Daly River is over 10 km long and 1 km wide in places. Other large tracts occur along the floodplain margins of the Adelaide, South Alligator and East Alligator Rivers. The most common species of the lowland monsoon forests are the black wattle, milkwood, kapok or bombax tree, banyan tree, and the peanut tree (Sterculia quadrifida). Many types of vines grow in these forests including the crab's eye vine, round yams, long yams, native jasmine, and wild passionfruit. The forests have a canopy that closes out much of the light, even though some of the trees are deciduous and so there is little grass growing on the forest floor. There are many seedlings awaiting their chance when a gap in the canopy occurs, and a small number of ground orchids. In some locations ferns (Blechnum spp.) may be common. The monsoon forests are the stronghold of two Top End snakes. The carpet python preys upon rats, bandicoots, small wallabies, possums and fruit bats. The smaller green tree snake eats frogs, lizards and fish stranded in pools. There are two interesting ground dwelling birds, the orange-footed scrubfowl (a mound builder) and the rainbow pitta. The dusky honeyeater, shining flycatcher, yellow oriole and figbird are common residents of the rainforests. Three species of pigeons feed upon fruit in the forests: the rose-crowned fruit-dove, the pied imperial-pigeon (Torres Strait pigeon) and the bar-shouldered dove. These birds, along with flying foxes, are important agents of seed distribution in this habitat. Like the imperial pigeon, the common koel or rainbird is a migrant from New Guinea for the wet season during which time it breeds by laying eggs in other birds' nests. The grassland melomys is a native rat that inhabits a range of coastal grassland habitats including isolated grassy patches within the rainforests where sunlight has penetrated. Waterfalls plunge over the edge of the escarpment down deep incisions, into pools that are surrounded by dense sandstone monsoon forests. The waterfalls are spectacular during the wet season as they offload the rainfall on the elevated stone country. However as the dry season sets in, the waterfalls dry up, often to a trickle. 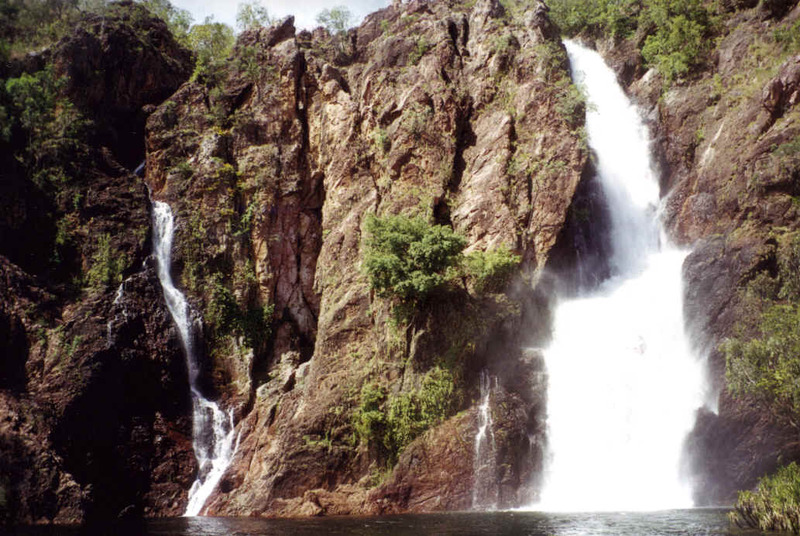 Some of the falls, particularly in Litchfield National Park, continue to flow because of the large amounts of water that is absorbed by the rocks themselves and which trickles out of springs. 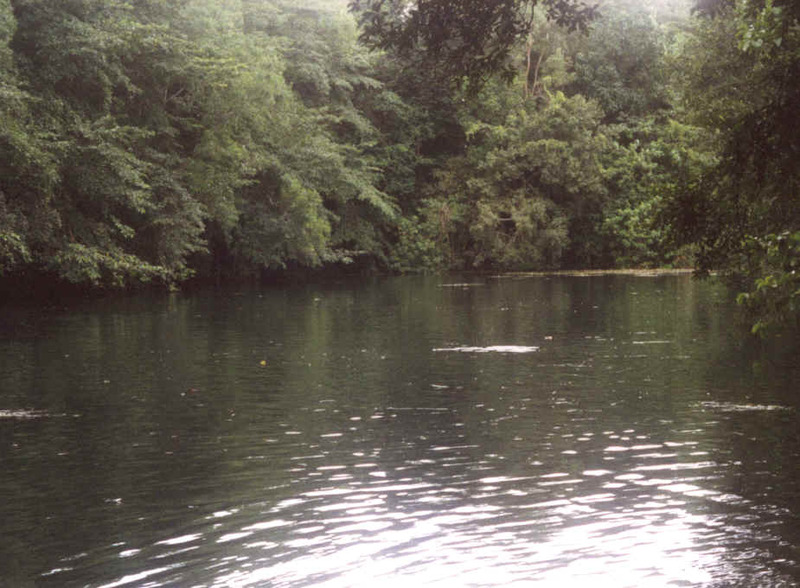 The dominant trees in the forests around these pools are Allosyncarpia ternata, as well as the Carpentaria palm. Many of the plants and animals are those found on the coastal monsoon forest, while freshwater fish, turtles and frogs can be found in the pools.